Waiotapu is an active geothermal area at the southern end of the Okataina Volcanic Centre, just north of the Reporoa caldera, in New Zealand's Taupo Volcanic Zone. It is 27 kilometres south of Rotorua. The area has many hot springs noted for their colourful appearance, in addition to the Lady Knox Geyser, Champagne Pool, Artist's Palette, Primrose Terrace and boiling mud pools. The geothermal area covers 18 square kilometres. Prior to European occupation the area was the homeland of the Ngati Whaoa tribe who descended from those on the Arawa waka (canoe). The area has a long history as a tourist attraction. While the area has been protected as a scenic reserve since 1931, a tourist operation occupies part of the reserve under a concession. 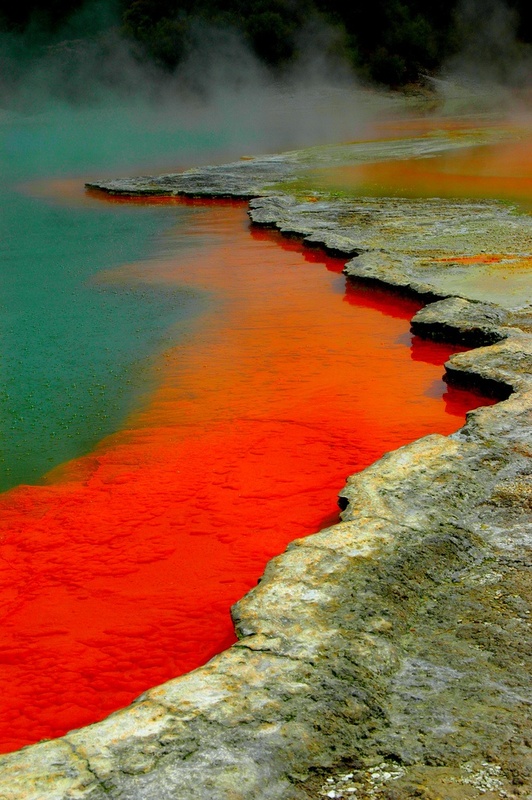 It operates under the name "Wai-O-Tapu Thermal Wonderland". The business was bought in 2012 by Te Arawa Group Holdings, a local Maori tribal business, from the Sewell/Leinhardt family, who had run it for 30 years.